But he was not just any man. He was a male so perfect that words would catfight each other just for the honor of describing him. He was a god. A bone fide deity. He had to be. Because a normal man wouldn't give her the urge to fall to her knees and worship at his feet. Or drool. "Your mate," he said, then slowly bent his head to nuzzle her neck. "Designed by fate and the universe to be your ideal companion in every way." His breath tickled her neck. He seemed to be completely absorbed in the act of nuzzling. What if Niccolo lost? What would happen to her? And wasn't fighting naked sort of dangerous? Not to mention inappropriate? Yes, of course my bride should be the cautious type. This will ensure her survival. He smiled inwardly. Perhaps, the universe was smarter than he thought. It was beginning to appear that his mate had all the right traits. Physical and mental. He was going to enjoy learning her. Thoroughly. "First," he announced, "I am going to tell you my story, and then I'm going to tell you how you've changed my life, and how much I love you." "You--you love me?" she muttered. Smiling warmly, he nodded and stroked her cheek. "We are not to that part of the story, yet, my love. But be patient." I read the first book, Accidentally in Love with...a God? over the summer for Mermaids & Myths month. I got pulled into the series from that start, and I've been thinking of this second book ever since, so I am so glad I've finally gotten the time to read this one. The humor dripping from these stories is magnificent, and the overall plot is fantastic. I am seriously falling in love with this entire series. 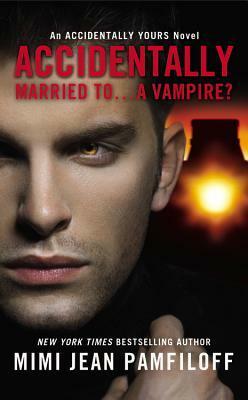 And while I super enjoyed book 1, I definitely loved Accidentally Married to...a Vampire? even more. This one is told completely in third person, switching between three POVs--Niccolo, Helena, and Andrus. Helena, of course, was a spunky heroine with some great attitude. I really liked her, though he willingness to believe things so quickly surprised me. She's a very formulaic person. Very into science and working things out logically to find the rational explanation. And yet she believed Niccolo about being a vampire pretty quickly. And then she jumped on board with Andrus, too. Now, I can definitely chalk this up to the situations she was in for both those instances, but still. I was surprised. Doesn't change that I like her, though. Niccolo was wonderful. He's so manly and protective, but he's not intentionally forceful in a way that makes his come across as a jerk. He regrets when he and Helena argue. He feels bad when she's upset. And THAT was fantastic. Went a long way in showing how great of a person he is. Yes, he wants to protect Helena. But he doesn't want her to be unhappy, either. That's evident from the beginning and only becomes more pronounced as the story evolves. All of this added up to me loving Niccolo. And then there was Andrus. I have so many feelings for this guy. They're all over the place, but in the end I just feel bad for the guy--and now hopeful. He has a good heart. He's not seriously bad, and that showed for a majority of the story. That's all I'm going to say about Andrus because I don't want to spoil anything. Just know that I really, really, REALLY like this dude when it all comes down to it. Whereas the romance was very hot and cold in the first book, this time around it didn't get as frustrating. It took longer for the couple to truly get together, but they weren't annoyingly fighting all the time and messing things up when they were just looking good. Instead, Niccolo and Helena start out wobbly, and then their relationship grows stronger as the story progresses. Not without a bunch of other ups and downs accompanying, but the arc of their romance was still more appeasing to my poor feels. I freaking LOVE Niccolo and Helena together. They make my heart happy. The writing was humorous and captivating. I adore how funny this book was, and I was hooked from the very beginning. The plot had more tricks up its sleeve than I anticipated. I thought I'd have it figured out like I did with the first book, and I suppose I did guess ONE thing, but the great majority of those twists I did not see coming. The surprise behind that was incredibly satisfying, and made the story that much more enthralling. I also enjoyed how the story fit into the world created in the first book, but this novel also paved its own way. There's some overlap (*cough*Cimil*cough*) but most of this one is new. Still connected and in the same world as book 1, obviously, but also different. It was fun. Overall, Accidentally Married to...a Vampire? was a fun, enthralling read that I absolutely loved. The humor was perfect, the plot was interesting, and the characters earned my devotion. Not to mention that romance that made my heart sing. This novel was seriously great, and I can't wait to pick up the next book soon! I've already looked at it, and I'm sure I'm in for another good time. Yay!